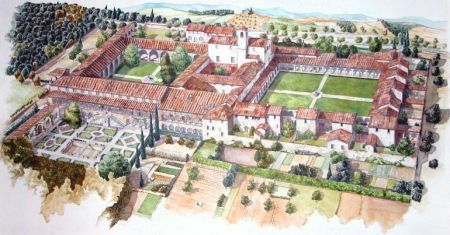 In 1341, Bindo di Falcone, a gentleman from Sienna who had become rich through trade with the Papal States, bought land and goods in the small town of Pontignano, and gave them as a donation to a Carthusian monk from Aquitaine, brother Amerigo, so that he could establish a monastery dedicated to Saint Peter. The Carthusian Order, at that time, was expanding throughout Italy, and Tuscany was one of their favorite locations. 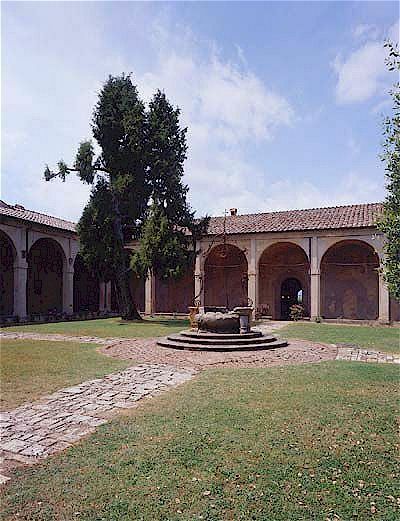 Several monasteries were set up: first among these, the monastery at Maggiano built in 1314 on orders from Cardinal Riccardo Petroni, a cousin of Bindo di Falcone. Later on, two Carthusian monasteries or “Certose” were built: the one at Belriguardo, with the support of the banker Niccolò Cinughi, and the one at Pontignano. On August 8, 1343, the Bishop granted permission to Bindo di Falcone - who had already overseen the work at Maggiano as executor of the will of his cousin the Cardinal - to set up the Certosa. The plan provided for building a church, with cloisters, cells and service buildings which could “House twelve fathers, twelve lay brothers and their servants”. 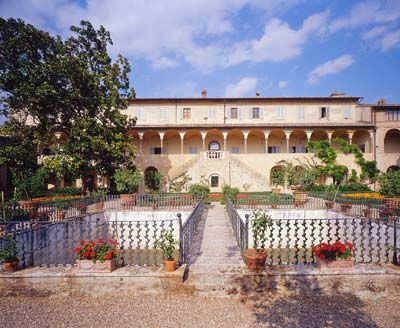 Despite the interesting project, the Carthusians seemed unwilling to go and live in Pontignano: Messer Bindo therefore decided to pay Pope Clement VI a rich indulgence for ten monks who - by going to live and die in the new Certosa - would have their sins forgiven. The last to be built, the Certosa of Pontignano is the only one to preserve its original atmosphere as an oasis of peace today. The other two, Maggiano and Belriguardo, were in fact put to uses which were different from the original ones. • the area set aside for the church, the chapter and the refectory around the cloister, the real heart of the whole complex. The church - the first building to be built - preserves certain 14 C features, such as the thick surrounding walls and the arcades. 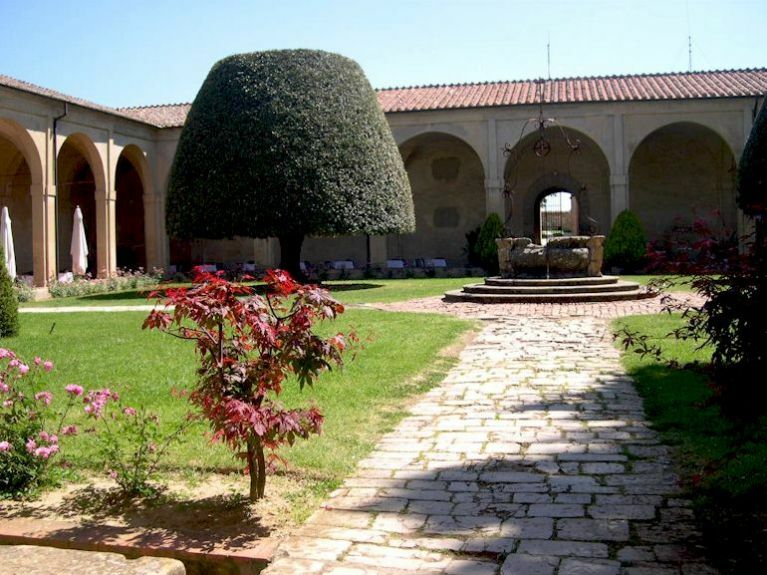 The Certosa was built in the open countryside on the border between the states of Florence and Sienna. It therefore needed to demarcate its own borders and defend itself against raiding mercenaries. In 1385, the state of Sienna, acknowledging the importance of the settlement, had strong walls built around it. In the same year, Stefano Maconi, Saint Catherine’s favourite disciple, was appointed prior of Pontignano. It was probably he who obtained the relic of the ring finger of the Saint - the chapel, later painted with frescoes by Nasini, was built to host it. 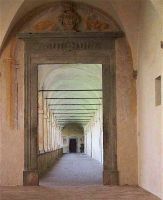 The Certosa also enjoyed the protection of Gian Galeazzo Visconti due to the reputation acquired by a monk from Pontignano who oversaw a large part of the building work in the Certosa of Pavia. Its walls notwithstanding, the Certosa was sacked during the war between Sienna and Florence. In 1449, a band of Florentines broke in and, during the famous “Congiura dei Pazzi”, the monastery was set on fire. Immediately after it was again damaged: in 1554, German and Spanish militias sacked the monastery. 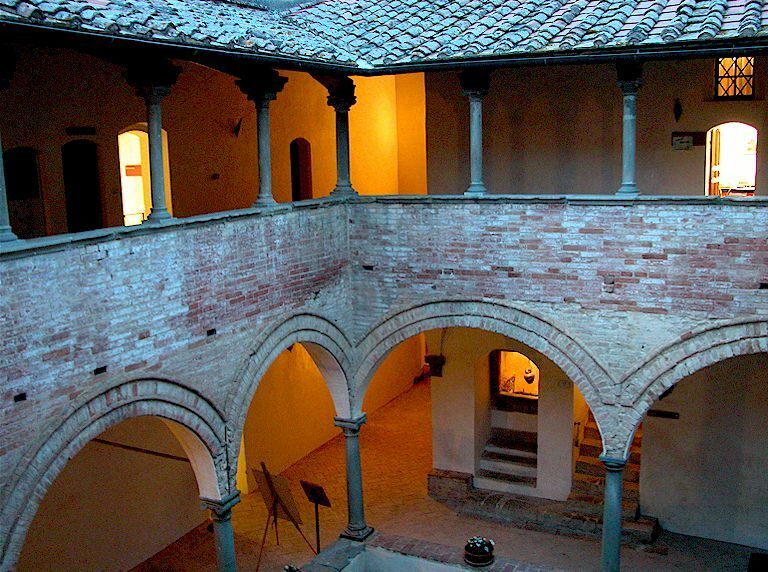 During the late 15 C, the building received considerable impetus from Renaissance influences. 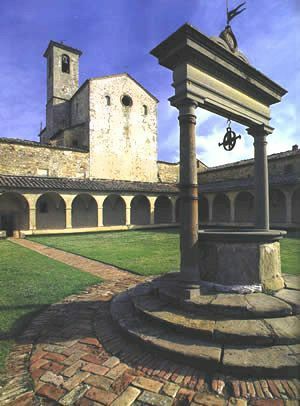 These are visible mainly in the cloister along the long side of the church: its square layout, with five spans per side and sail vaults held up by small columns with ionian capitals express equilibrium and sobriety. Other minor work was done at the end of the 17 C, when the rooms along the eastern side of the monastery were refurbished: the six chapels built previously were united in the so called “Cappellone” or big chapel. In 1703, the Chapel of Saint Agnes was built: its door lies at the end of the eastern arm of the big cloister. 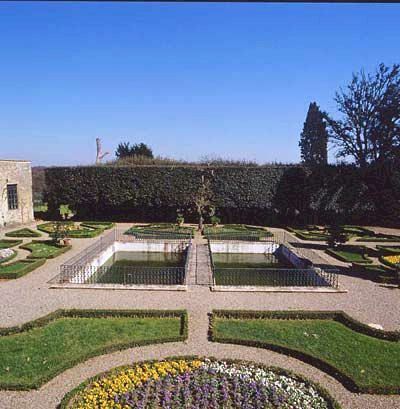 The Carthusians who had devoted so much care to Pontignano, making it an oasis of peace, left the Certosa at the end of the 18 C. A document dated July 16, 1785, transferred Pontignano to the monks of Camaldoli, who however were forced to leave it when the convents were suppressed under Napoleon. The parish of San Martino a Cellole was then moved to Pontignano; the buildings, except those where the parish priest lived, were purchased - together with the old monks’ dwellings and some land - by the Masotti family, who sold them in 1886 to the Cecchinis, who in their turn passed them on in 1919 to the Sergardis. In 1939, the area became the property of the Certosa di Pontignano company, one of whose shareholders was Professor Mario Bracci. In the same period, the future Judge of the Constitutional Court had the villa and the small middle cloister repaired at his own expense. Throughout the war period, Pontignano was a secure place of refuge for Jews and the victims of political persecution. In 1959, the complex was purchased by the University of Siena, who then turned it into a university residence. The extensive work undertaken during the Renaissance and later have not altered the harmony which was the foundation of the life of the Carthusians: the equilibrium between Man, Faith and Nature. The Chianti countryside shows its softer aspects here. 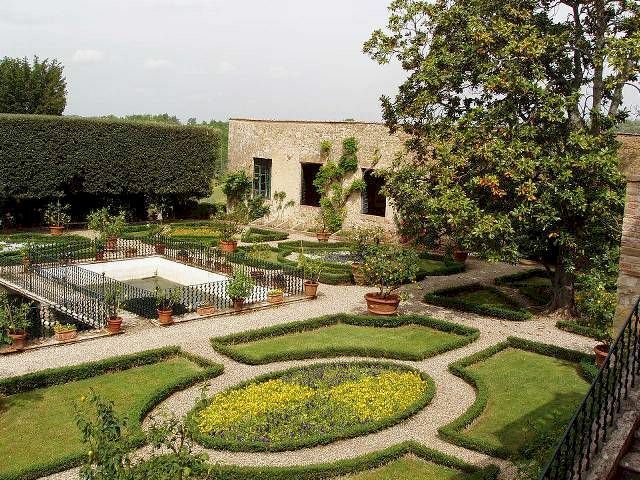 The ills accompany the traveller towards nearby Sienna, while vineyards and olives surround the Certosa and a carefully tended countryside penetrates into it, turning into precious gardens. There is no separation between inside and outside; between the environment and its harmonious architectural structure and the works of art which enrich it. It is especially in the churches that one can find the most important evidence of this. On the inside, the first church, built with a single nave and subdivided into three spans covered with sail vaults, has a masonry wall with an opening in the middle which used to divide the space into two areas of different width: one for the monks, the other and smaller one for the lay brothers. This was largely the work of the Florentine painter Bernardino Potetti, who had also worked for the Carthusians at Calci and Florence according the canons on painting laid down by the Counter-Reformation. Samples of his work are to be found on the walls with the Carthusian stories of Saint Bruno and Saint Peter, on the canvas and the decorations of the main altar. The choir stalls are by the carpenter Domenico Atticciati. The rest of the decorations were completed by Orazio Porta, Stefano Cassini and painters from Siena whose style clearly comes from that of Francesco Vanni and Alessandro Casolani. Potetti was also the author of the fresco with the “Last Supper” in the refectory (1596), and a fresco with the “Samaritan at the Well” in one of the monks’ cells as well as a lunette with the “Death of Saint Bruno” over a door facing the cemetery. In the “Cappellone”, next to the church, the painting on the main altar is attributed to Francesco Vanni, while the decorations and frescoes on the walls are attributed to Nicola Nasini and his son Apollonio. In the chapel to the right of the small church, the altar shows the “Lamentation of Christ dead and the Saints”, a work which has recently been associated with the name of Cristofano Rustici, as further evidence of the work carried out here by artists of the Siena school.